Fresh, baby ginger is sweet yet savory, lusciously melting in your mouth and nearly fiber-free, entirely unlike the mature ginger shipped thousands of miles, what most of us have known as ginger our whole lives. Which it certainly is ginger, and so divine! But trust me: Freshly dug baby ginger is an altogether different experience. I'm so grateful share the opportunity to cultivate and savor it with you. Even the leaves smell of ginger, full of fragrant volatile oils, which we dry and steep as tea we enjoy all winter long, as well. It's heaven. For well over a decade our friends have been growing ginger on their farms in greenhouses and high tunnels. Finally, Matthew and I decided to grow it on our farm and not only in our high tunnel. We grew ginger in the field. We grew ginger in containers. We paid attention to some but most of our plants we actively tried to not pamper. What would happen?! 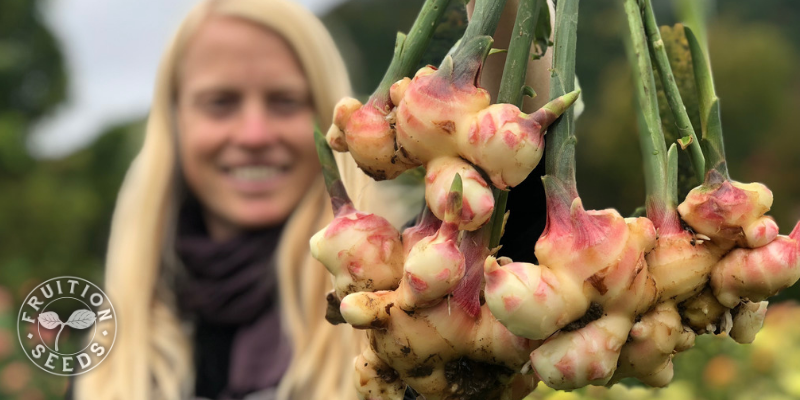 Here's what we learned: Growing ginger is remarkably fun, far from foolproof and nonetheless possible, even in our short seasons. Organic Ginger for You to Grow Your Own! So yes, we have organic, un-sprouted ginger ready to grow for you! You'll also find gorgeous organic ginger transplants at Fruition's Farm Store on weekends in May. 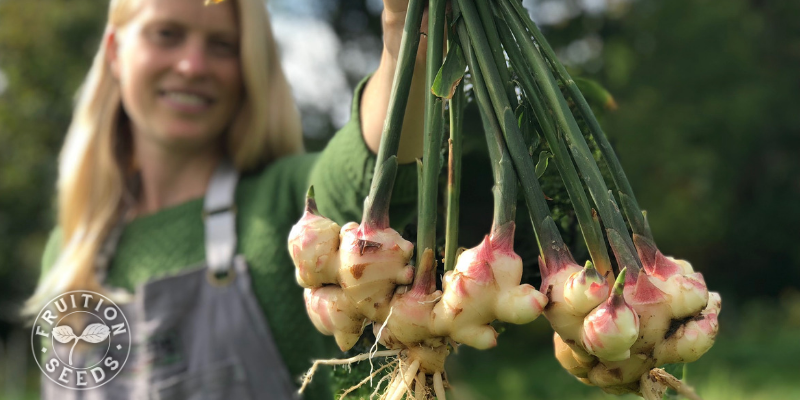 Both online and on-farm we have little tricks of the trade to help you grow gorgeously abundant ginger this season! In this blog, I'll share the keys, the bare essentials, the basic progression of how to grow ginger. Think of it as me humming Beethoven's 9th. If you want the full symphony, if you want the step-by-step instructions, we share it all in our Grow Your Own Ginger Masterclass. You'll find hours of in-depth video tutorials surrounding you with resources and inspiration, including live Q & A with me, all season long. 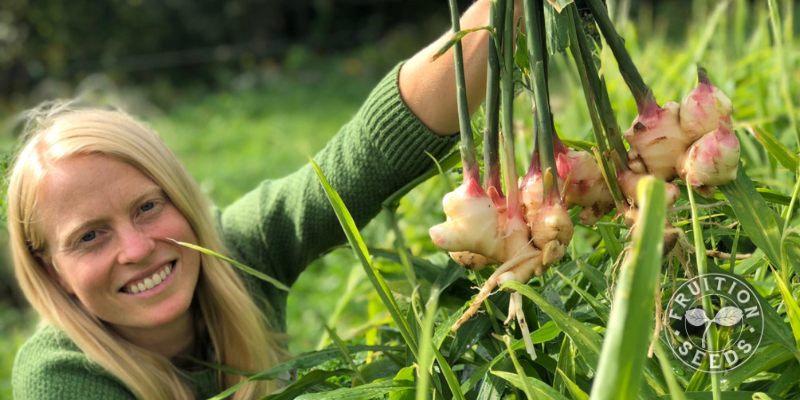 I'm also eager to share with you the passion, insight and story of our friend Howard James of Ginger Ridge Farms in Hawaii, who grows the extraordinary organic ginger stock we grow and are honored to share with you. Read on. In our gardens and in our lives, so much of what you reap is what you sow. Ginger is no exception. A number of years ago I grew several ginger rhizomes purchased in a grocery store and here is what I learned: Conventional ginger doesn't sprout (it's likely sprayed with chemicals to prevent sprouting) and organic ginger sprouts sometimes, though not consistently or vigorously. If you've grown garlic before, it's similar to ginger in terms of sourcing your 'seed' stock. 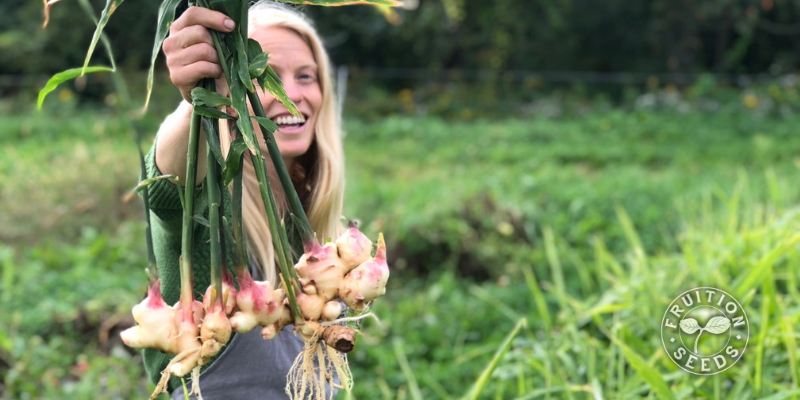 You can plant most organic garlic and ginger and it will grow, but if you really want to grow the biggest, healthiest organic bulbs and rhizomes possible, simply sow the biggest, healthiest organic stock you can find. 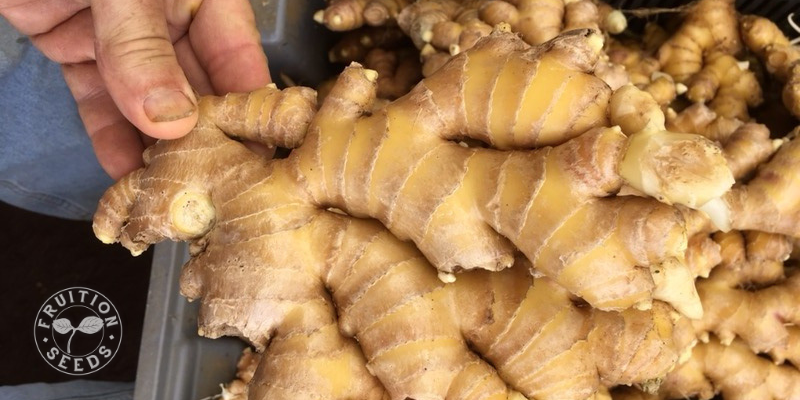 Fruition's ginger stock is grown by our friend Howard in Hawaii, and his 'seed stock' ginger will leave you without question why this is the ginger you must plant. Note: It is possible to grow and save your own ginger rhizomes here in the Northeast, but we've found that the slight skin that forms in our short growing seasons doesn't allow the rhizomes to store effectively in our winters, even protected indoors. Howard's stock is many times more vigorous than anything we have saved, which is why we eat everything we grow and are grateful to get fresh stock from him each season. Sprouting ginger is equally an experience of joy and exercise of patience! Without question, heat mats make all the difference. Raising the soil temperature 15-18 F above ambient room temperature, as heat mats do, is essential to initiate and sustain the ginger's optimal growth response. Without a heat mat, your ginger may take months to sprout. Even with a heat mat, your kale and tomatoes will grow much faster than your ginger: Don't be discouraged, ginger simply takes her time and now that you know, you can relax and enjoy her unfurling rather than worrying you're doing something wrong. 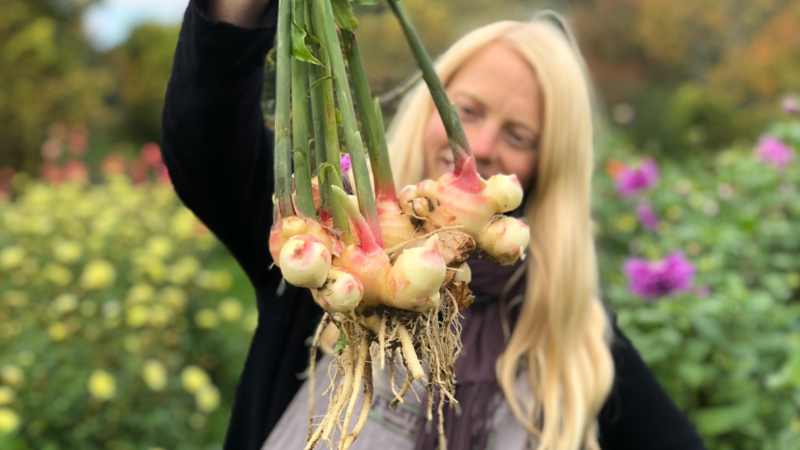 We share organic ginger stock for you to grow both as four gorgeous rhizomes as well as our Ultimate Grow Your Own Ginger Collection, which includes a heat mat, pots and soil to sprout your ginger plus perfectly formulated ginger fertilizer and 50% off our Grow Your Own Ginger Masterclass. Also, having exceptional light for your sprouting ginger will make a huge difference, ensuring your ginger is not stressed for lack of light, staying short and stout while she remains indoors before last frost. Note: Most 'grow' lights are not very effective as grow lights. If your plants are getting leggy with lights 6" away, your lights are ineffective, alas. We grow under full-spectrum LED lights our friend Vic makes in Illinois and are honored to share them with you, as well. Harden off your ginger transplants for at least five days before transplanting them outside after final frost. 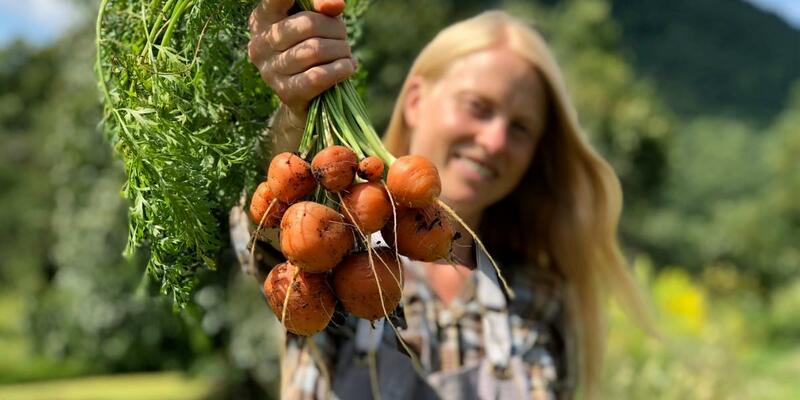 Plant them in rich, well-drained soil with full sun and feed them immediately for optimal health and abundance. We've created our own blend of organic nutrients specifically for our ginger that is easy to apply, sustaining robust plant health with impressive rhizome development. It comes with easy instructions and will feed four plants all season long. Growing ginger in large containers is genius on so many levels. You'll do less weeding, your ginger will be easier to hill (see #4) and if the color is of your container is dark (like our forest green containers) it will stimulate your ginger to grow more quickly. The containers we use (and share here) are fabric so they breathe, your plants naturally air-pruning their roots rather than become root-bound. I recommend the deep forest green for your ginger as well as tomatoes, squash and any other crops that thrive in heat. Just as we 'hill' potatoes to grow the highest quality potatoes, ginger also requires 'hilling' for optimal rhizome abundance, though potatoes and ginger are hilled in very different ways. 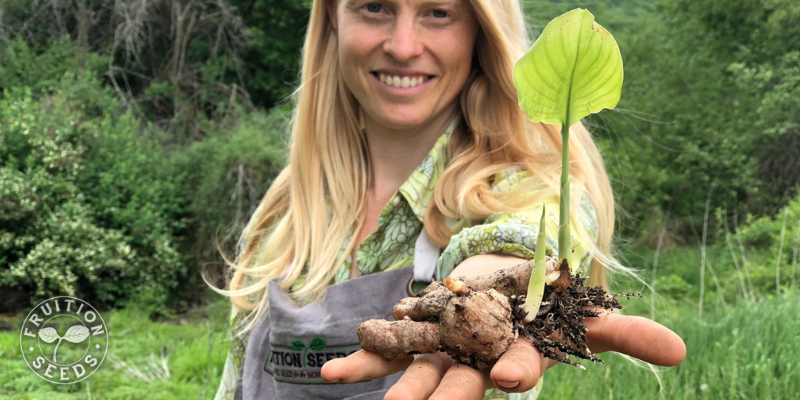 Every few weeks throughout the summer, when you see green nodules rising from the rhizome below the soil, sprinkle more of our organic ginger fertilizer over the plants and add a scant additional inch of soil and/or finished compost on top of your emerging rhizomes. This blocks the light from directly hitting your rhizomes, spurring more leaf production. We hill several times each season. Harvest your ginger before the first frost with a digging fork, giving each plant a wide berth so you don't accidentally puncture your glorious rhizomes. I love to harvest her before the leaves start to turn yellow, as they will as the cold draws near, so their flavor is still full for our winter teas. Where Does Our Ginger Come From? We heard about Howard James of Ginger Ridge Farms for years before we finally sourced his organic ginger to grow our own. We were instantly blown away by the exquisite health and vigor of his rhizomes, not to mention falling in love with him, as a human. I shared a conversation with Howard in early February 2019, just as he was shipping us the stock that we now share with you. "The depth and strength of farmers is great. It is a courageous path to be that kind of person," said Howard. And indeed, he is. 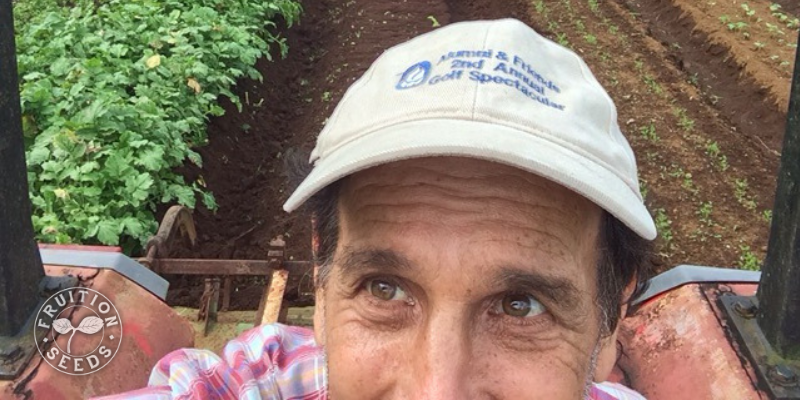 Howard has lived in Hawaii since 1976, cultivating his own farm since 1980, but let's back up. Raised in New York City and protesting in the '60s, Howard has a deep love of music, in some ways his first calling. Quickly a twin love of martial arts blossomed into a deep study of healing arts which led him toward China. Happenstance outside Maui's Hari Krishna food store in 1976, on his way to China, changed his trajectory forever and he's lived on the Big Island ever since. "Being with nature, being a steward and working with plants is a deep medicine for ourselves and for our world," he shared with me. "Perhaps working with plants is one of the few things that truly makes sense in our crazy world." When I asked him why he loves growing ginger, he paused for several rich seconds before responding, "It's the color, it's the gorgeous, beautiful leaves and it's all such a gift, such an expression of generosity. As a drink, as a spice, as a medicine. What a gift to share this gift." 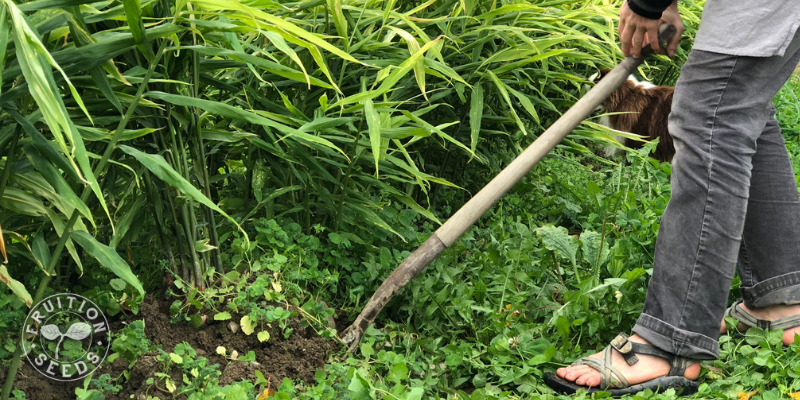 Howard has been growing ginger on his 45-acre farm (which he cleared himself, beginning by hand) on the windward side of the Big Island at 2000' elevation since 1980. No one else was growing commercial organic ginger at the time, so he dove in and continues to thrive growing ginger and turmeric as well as many other fruits and vegetables. "Go sloooooow. Let it sprout, gently cover it with more soil, lightly," he said. "Let it grow through that layer and layer soil more, again, lightly. More attention and more gentleness will go far. Ginger loves warmth and craves moisture, but more layers of rich soil more often will go the farthest to increase your yields." Finally, I asked him what gave him hope for the world. "Inside all of us is love," he said. "It's really a matter of us getting out of our own way, our fear, beyond the tension and stress that suppress our ultimate good. Our consciousness can realize this. Self-reflection is key. We are here. Goodness is all around us." Friends, it is an honor to share Howard's organic ginger stock for you to grow. I hope these tips surround you with abundance beyond what you thought was possible. Indeed, if we can make your life more connected and accompanied by what matters most to you, we will have imparted what so many elders and ancestors, both plant and human, have taught so many before us.